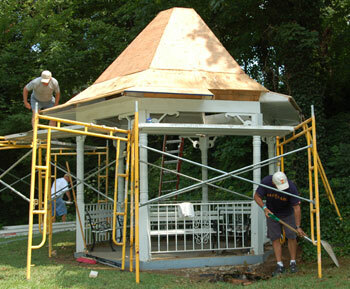 MILLIGAN COLLEGE, TN (July 28, 2008) – Milligan College’s landmark gazebo is getting a face lift this week, July 28 through August 1, as Milligan alumni and friends volunteer their time as part of the college’s annual “Restoration Crew.” Spearheaded by Milligan’s first lady, Clarinda Jeanes, the project is a time for volunteers to assist with campus improvements. More than 20 volunteers are doing much-needed odd jobs around campus, including painting, cleaning and landscaping. This year’s Restoration Crew volunteers hail from eight states, some as far away as Maryland and Indiana. Some of the volunteers have helped out each of the crew’s 10 years of existence, sacrificing vacation time and driving long distances to help. Volunteers come for various reasons, but a common theme is their love for Milligan College. Not only does Milligan touch the lives of its students, but also parents. Cheryl Hugunin of Illinois, the parent of a Milligan alumna, returned to Milligan this year for the eighth time as a volunteer with Restoration Crew. In addition to the clean-up efforts of the Restoration Crew, faculty and staff of the college will help spruce up the campus on Friday, August 8, at their annual campus-wide workday. They will undertake various projects around campus in preparation for the return of students on August 16. For more information about Restoration Crew or the annual faculty and staff workday, call 423.461.8756. Posted by tommy on July 28, 2008.